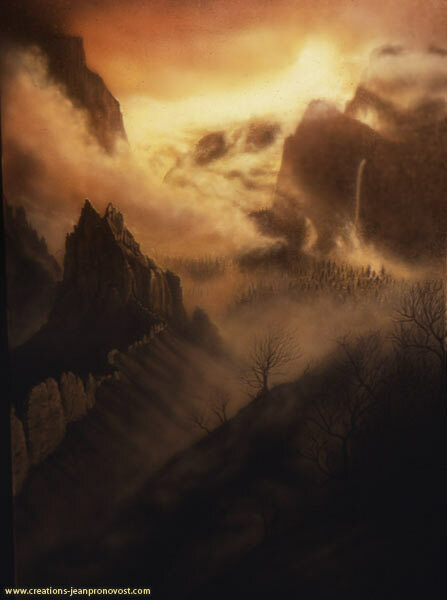 Airbrush painting is a technique which few artists master as well as Jean Pronovost. 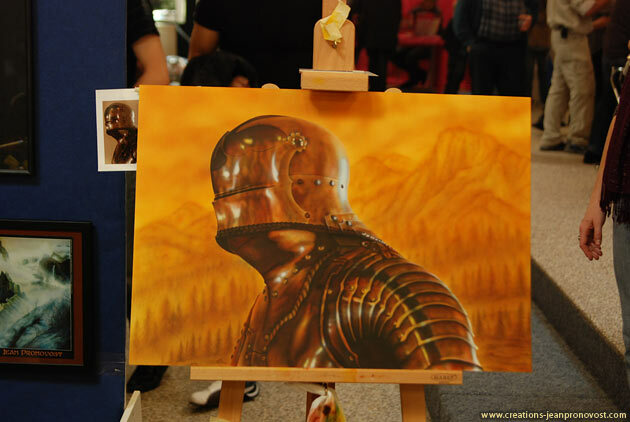 His broad experience using airbrush on murals, frescos, decoration design inside swimming pool and on a multitude of materials over the years has made him a versatile and skilled airbrush artist, his works always surprising in their attention to detail and realism. 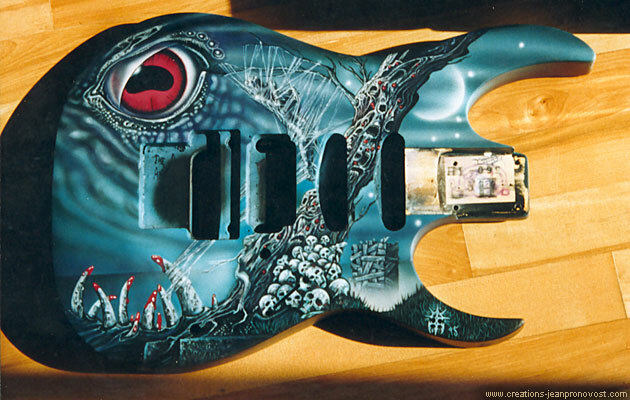 We see here the guitar reassembled after the varnish was applied, may have noticed the handle that was painted with the Metallica logo and even the singer’s signature on the neck. 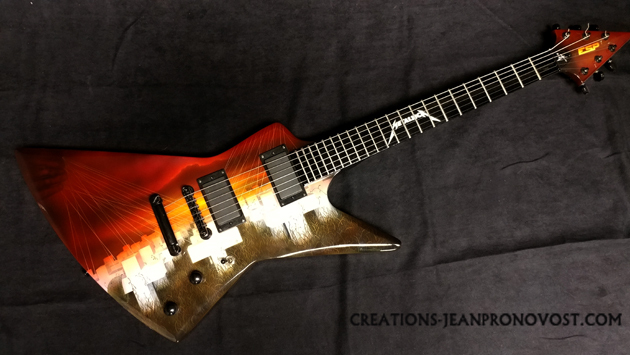 The guitar is now a true work of art, hommage to the band. 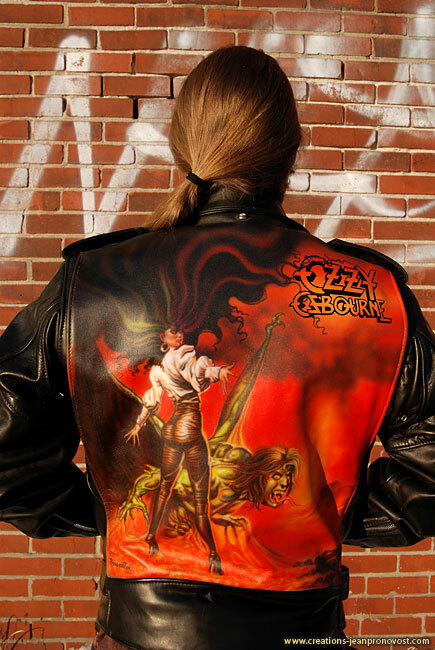 Airbrush painting on leather jacket inspired by the Ozzy Osbourne album cover « The Ultimate Sin ». 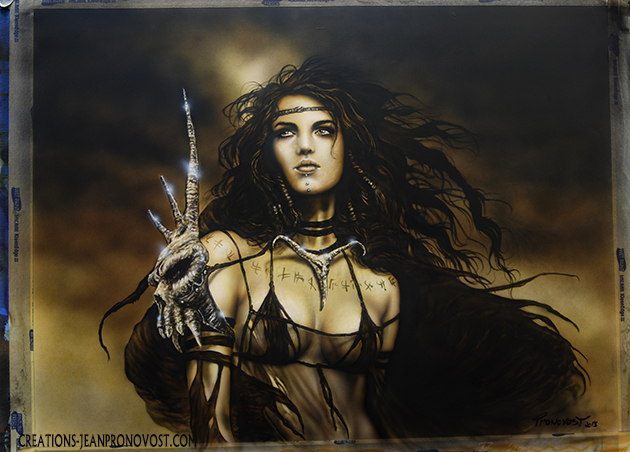 The original piece was faithfully reproduced using airbrush. Notice the quality of the characters’ detail as well as the vibrant colors. 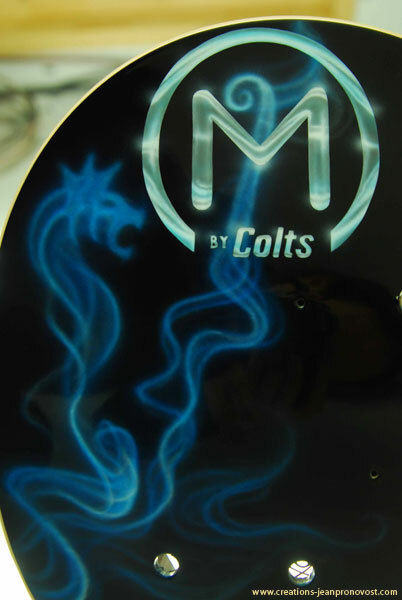 The Scandinavian Tobacco Group, which offers the Colt branded cigars, requested the help of the painter Jean Pronovost to paint two guitars using airbrush for a musical contest. 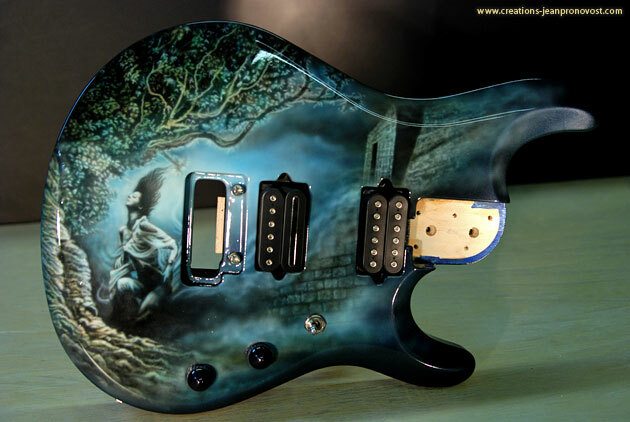 The artist had to recreate the logo of the company on both guitars and varnish them. 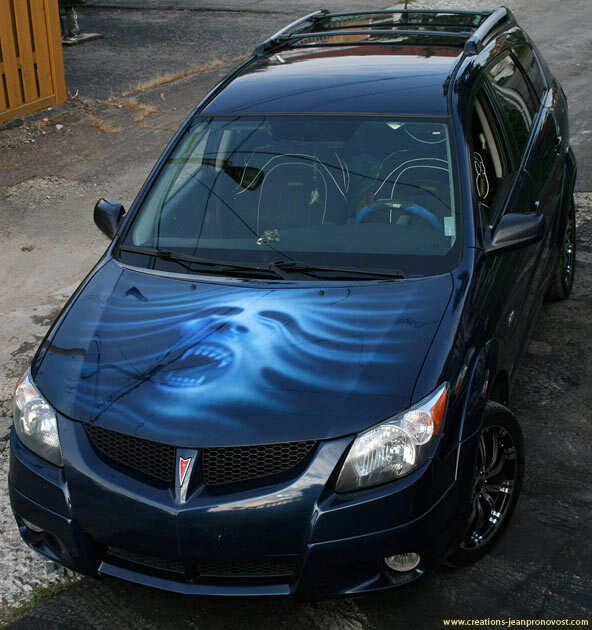 The hood of this car was painted with an airbrush. 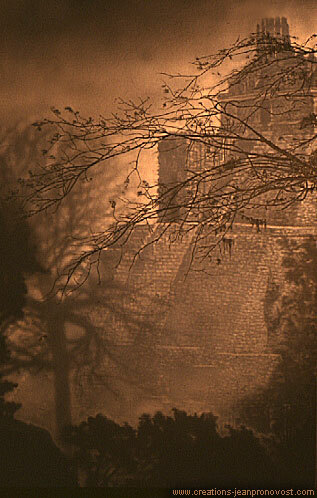 The vampire head literally comes out the vehicle as if the metal structure morphs into a drapery. 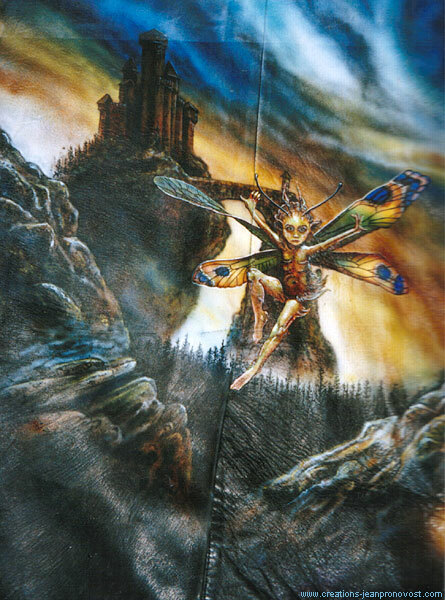 Gibson guitar airbrushed in 1996, the piece was commissioned for a customer from Quebec City who brought in an album cover of the death metal band Obituary and asked to have it replicated onto his guitar. 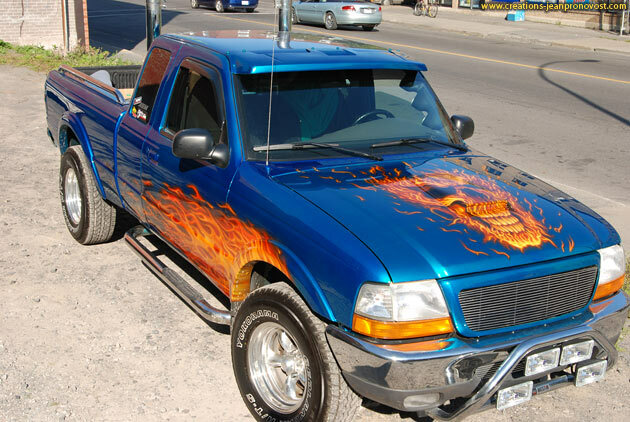 The East Montreal Boxing Club gave for the second time a huge airbrush assignment to Les Creations Jean Pronovost. 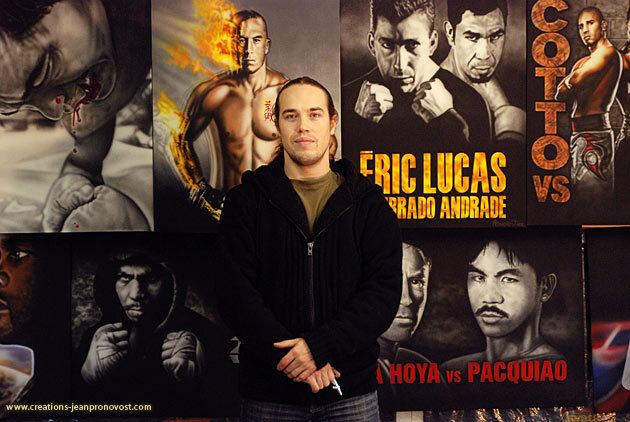 This series of painting all achieve with the airbrush represent all the important figures of extreme fighting and boxing around the world. Here is the painter in front of his work. 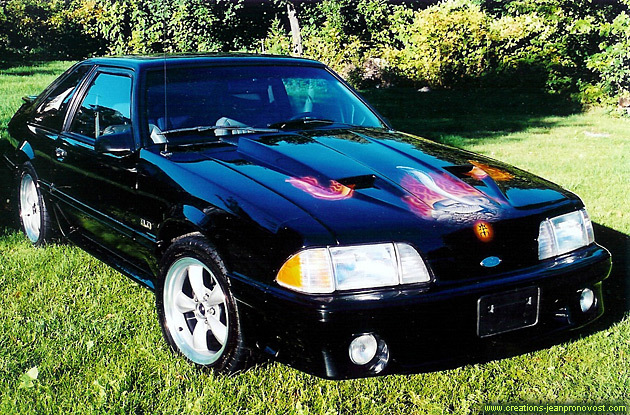 1989 Ford Mustang; the Rammer hood was airbrushed in 2004 using House Of Kolor urethane paints and varnishes. 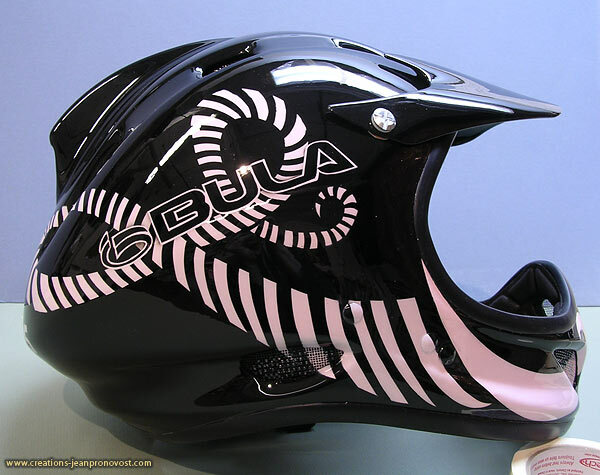 The cobra snakes, rendered in warm vibrant colours, weave in and out of the air vents and make this muscle car come alive and give it a truly unique and personal touch…. 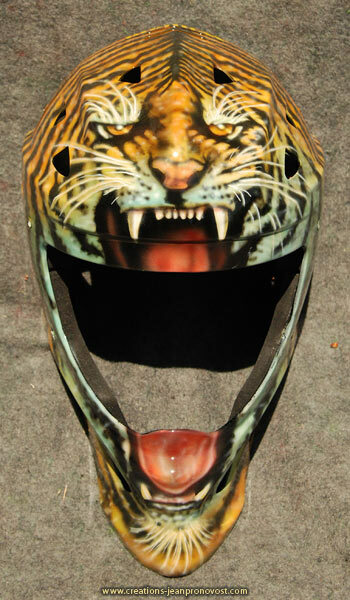 Hockey goalie helmet mask with custom airbrush tiger design. 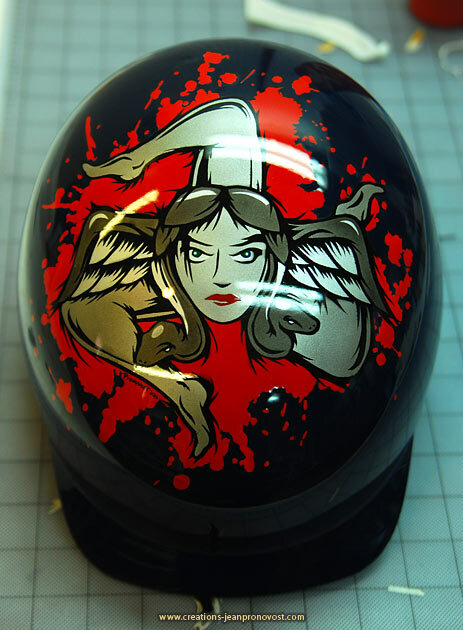 Aibrushed alpin skiing helmet, this job needed a lot of mask and precision cutting. 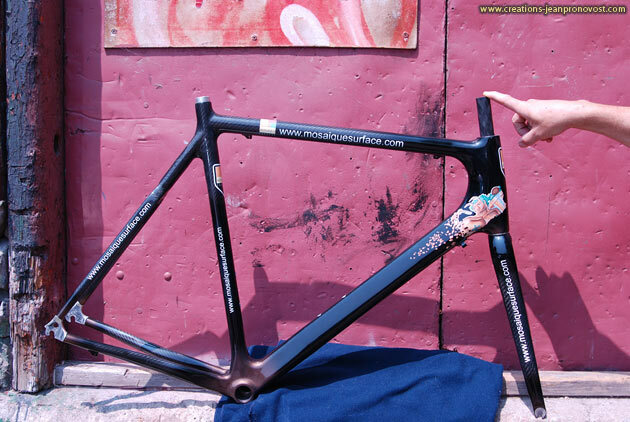 On this picture, the air brush work is clear coated, it will be protected from weather and scratches and also re-polish in case of an accident without damaging the air brush design. 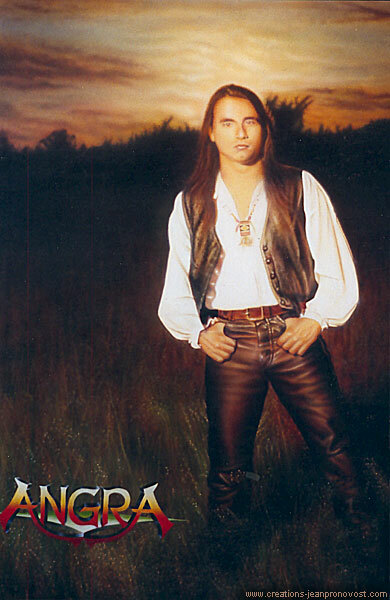 Airbrushed in 1999 on a 4’x 6’ canvas, this portrait of the Brazilian singer from the power metal band Angra was commissioned by a person from Quebec City. 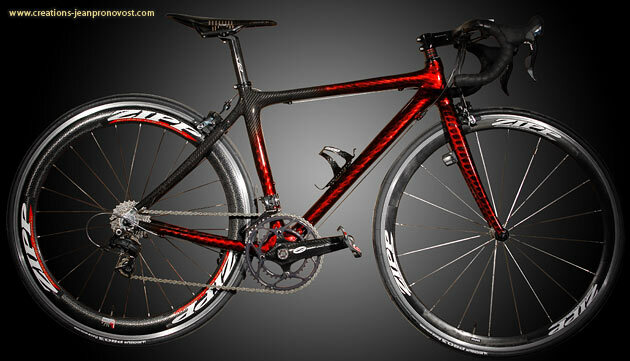 The hyperrealism achieved in this piece is so convincing it looks almost like a photograph. 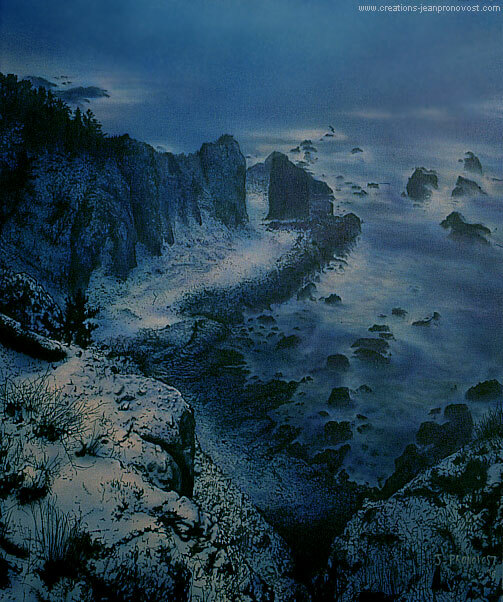 Artwork from Jean Pronovost (Winter Landscape, 18″ X 18″, 1998), this piece combines airbrush and traditional painting techniques to bring out details and an impressive realism. 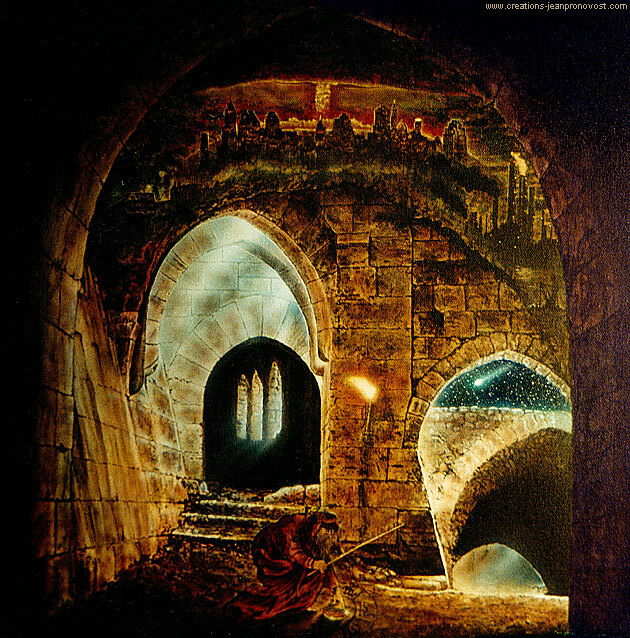 Ad Viam Æshma-Deva (39″ X 25″, 2001). 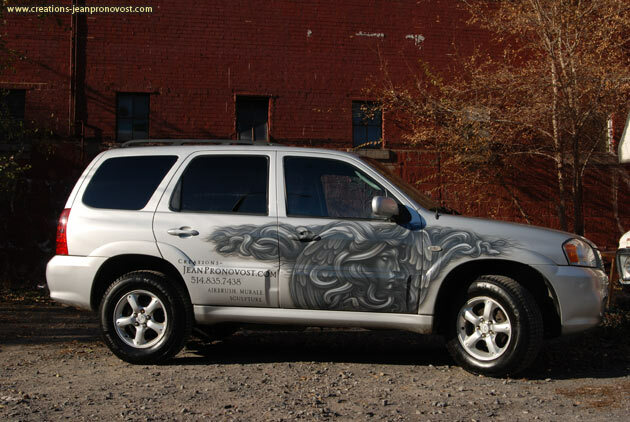 Created on canvas, using airbrush, this is a convincing, and hyperrealist piece from Jean Pronovost’s private collection. 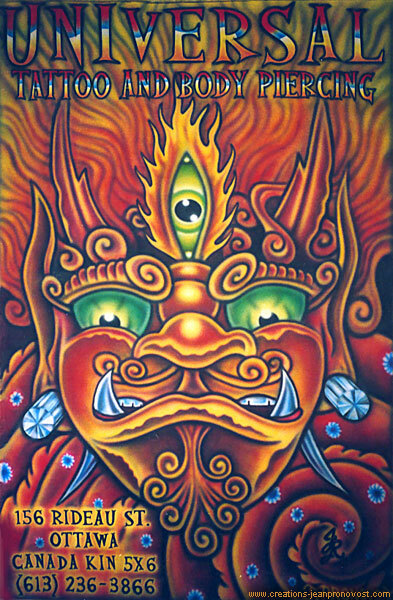 Temple (28″ X 36″, 1997-1998) is another piece from Jean Pronovost’s private collection, the use of oil paints and airbrush technique create depth and harmony. 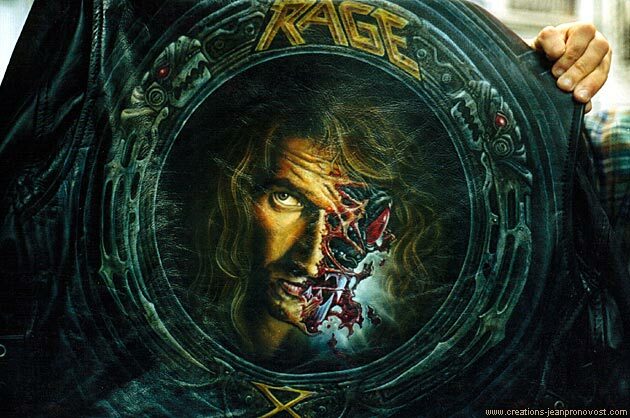 Hyper realistic rendering of an album cover of the band Rage, this was airbrushed on a leather coat 1998 for a Quebec City customer. The attention to detail, the contrast between warm and cold colours creates a life-like image you could almost reach out and touch. 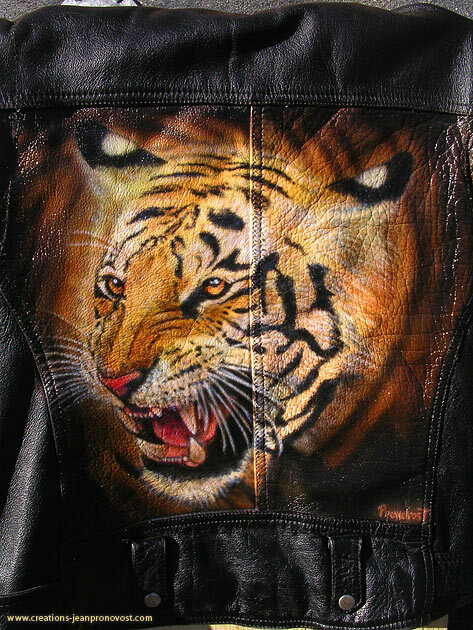 Realistic tiger head airbrushed on a leather jacket. 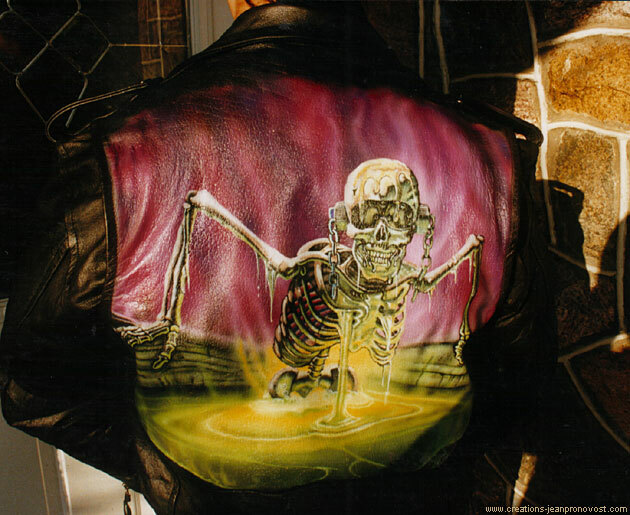 Illustration airbrushed on a leather coat, the compositional elements along with the movements seen in the clouds and the fantasy theme make a striking image. 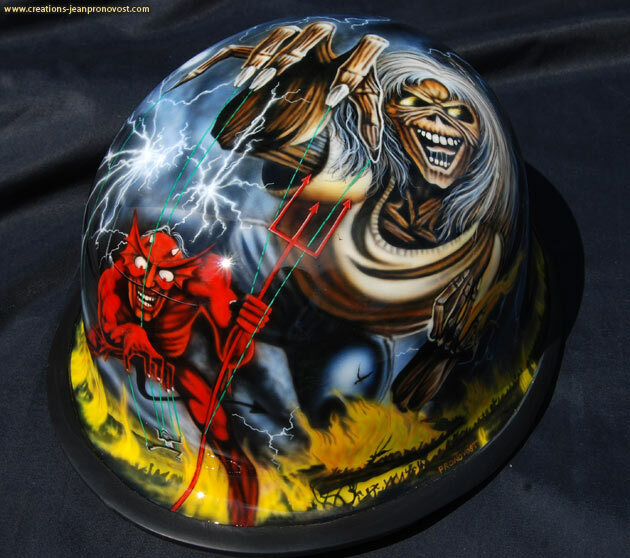 Airbrush painting on 40 yards containers for RCI Environnement, the most important recycling and garbage disposal enterprise in Quebec. 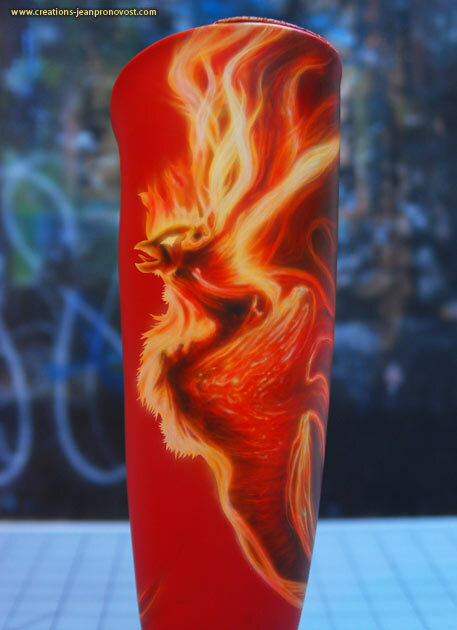 To help increase the consciousness of the population toward recycling, three containers were painted using airbrush. Those sympathetic pieces encourage and entertain the recyclers during festivals. Here, we see Fred, the recycler….